Description: Chortitza Mädchenschule; Original was likely a color postcard; this is a photo of the original image. 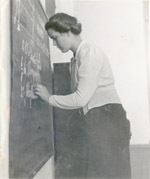 Description: handwritten notes on back, probably in Cornelius Krahn's handwriting, say "Agnes Epp, likely Chortitza Zentralschule, Russia; Anna Suderman(?) (Winnipeg) in center"
Description: Neu-Halbstadt Zentralschule; this is from a screen print, where is the original? 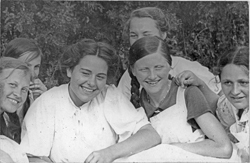 Description: handwritten on back "73881 Ukraine Chortitza Mädchenschule (vom Hof aus gesehen)"
Description: Marien deaf and dumb school; probably from a screen print, but where was it published?